Hi meitme, the Podium part of V2.6 beta doesn't need a license but Podium Browser does. Please send an email to support@cadalog-inc.com including your Podium Browser serial number and I'll send you a V2.6 beta license as soon as I can. Traveling today, but if you email before about 1:00 PST, I should be able to reply. Oh okay thanks: I was confused as it initially worked fully without a licence. If I swap over will I lose access to my V2.5 browser? I want to keep it for the time being. 5. I read a comment about PB V3 being slower. It is slower initially because it loads all the thumbnails and cache them. But, I think finding things are much faster once you get used to it. keep you right mouse button down and scroll the rows. I'd say it's slower to navigate because of the design. For example to find carpets on the old one takes two clicks (open 'Materials' and then 'Carpet'), now it takes three (opening the top menu, then materials, then 'see all' next to carpet). Having thumbnails for everything on the first page instead of an initial list to browse through makes it slower to navigate. You don't need to select See All. Just right mouse swipe thru the Carpet row. OK. In the wine example I do see caustic. That's a nice effect. Not so much in the pool though. Yeah. I do think that is refraction and do you have some bumps on the water material. Looks very realistic. Same problem with the new version (V2.6.017). Kugelfish - What is the Operating System - I mean is this a multi-byte Windows 10 system. If so, there is a bug for Japanese, Korean, Chinese but I didn't think this would effect cyilliric language versions of Windows. Maybe it does. So what happens is if you click Podium Browser V3, nothing happens. Open the Ruby Console and click on Podium Browser V3....do you see a long line of errors regarding UTF-8? If so, your Windows OS is not compatible with the current version of PB V3. Download the .zip file and unzip it to make it an .rbz. Then use Extension Manager to install. It's not Trimble signed right now because the Trimble Extension sign system is having problems. But I'm trying to get PB V2 signed but signed or not, it works fine. My Operating System ist Windows 10 64bit (1809). Language is German. I hope you can fix it. Thanks for your help. It's very handy that the Podium setting are saved within the scenes. I often copy a scene to make little adjustments and so keep the previous scene. I personally think it would be useful if the Podium settings are also copied with the scene? Now you have to set all the parameters again. How do you mean? In Generate? I thought the scene settings were transferable from machine to machine if you use Generate. No, it's not from machine to machine, It's all in the same model. When I duplicate a scene, the settings from Podium are not copied to the new scene. It works like this: in a model I create a scene, I set my parameters for Podium and Update the scene. Then when I add a scene, your view and all you've set in SU are also copied from the scene that is current active. But the Podium settings fall back to default, in this case to a panorama and HDR settings. So, when you create a new scene, you want the settings from the previous (last current) scene to be used instead of the default ones? I did discover one thing that your commented made me test and that is, if you use Generate with an HDRI backgrournd and then render the .scripts on a different machine, you get black image. What is happening is the PodiumHDRI location is hard coded into the .scripts. But we are fixing that. Back to your question or wish, I see what you mean, you want to copy the Podium scene data to a new scene. I'll have to ask Anton about that. 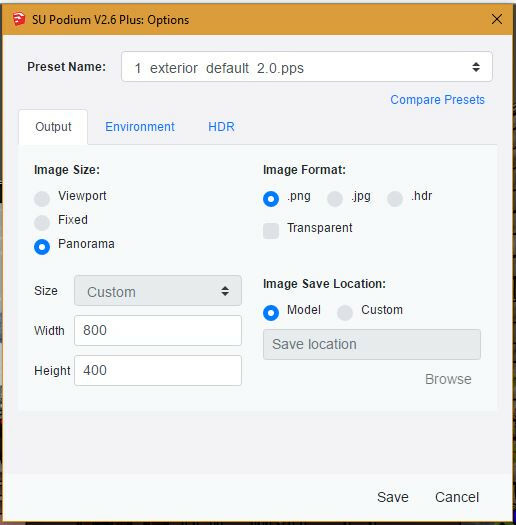 If so, it maybe wise to choose other standard preset, because I guess a panorama of 800x400 with a HDR evening02 will not be used most of the time? Crash problem driving me crazy. Using Podium Beta 2.6, Apple MacBook Pro with Mojave 10.14.2, 16 GB RAM, 500 GB SSD. Every time I click on Stone Tile Granite to pick a particular sample, it crashes Podium and SketchUp instantly and completely. This has happened two times in a row now. However, when I picked a wood sample, it loaded into the drawing as it should. What's going on? I'm also having typing latency when putting selections into the search window. Something's not quite right. Run the Analyse tool (spanner/wrench icon) and see what the output says. Sounds like there is a problem with that texture or the material configuration. The latency with the browser is intrinsic to its design. I have flagged it up before. Periodically it improves, but it does seem to be a fair bit slower than Browser V2 to me.